Come enjoy one of Crossville's championship golf courses, visit the Cumberland County Playhouse, fish on our lake or just relax on our peaceful campground. We are sure you will enjoy this little slice of heaven. This was our first trip of the year! Happy to have found this lovely campground to begin the season! Arrived on a Friday at 12:30. escorted us to our site on the lake and assisted with backing in, which I appreciated as we are new to RVing! Site was a gravel site with full hook ups. Every site has a clean charcoal grill, table and chairs, and a two person swing to enjoy the view of the private lake. There is a fire pit at every site too! Firewood was available for all and had a nice slow burn. Our weather over the weekend was perfect. Two chilly mornings close to freezing then warmed up to the 60's with lots of sun. There was a rally going on at the park with the Tennessee Sunshine Travelers. They were meeting in the clubhouse and gave us a warm welcome when we popped in. They invited us to join them for breakfast the next morning, which was so delicious! We thoroughly enjoyed meeting so many wonderful fellow RV'ers. The park has cable TV and WiFi. Cable TV worked fine with over 30 channels (so we could watch some March Madness). WiFi was adequate for surfing and email, however, trying to stream video was a challenge, which may be critical to some but did not interfere with the fun we were having! The private lake is a catch and release fishing spot and I did catch a couple of nice bass. In closing, I would strongly recommend this RV Park as it was clean, staff very friendly and has a great location that is very quiet. We did not use the laundry or rest room facilities but did take a peek and they were immaculately clean. We would definitely recommend this park! A wonderful, quiet place to unwind. #47 was a great spot for us and our lab. The wrought iron bistro type table and chairs are a welcome change from the usual picnic table and the swing was such a nice touch. Even tho the temp was chilly, we enjoyed swinging and watching the swans ??. Each spot was level and had a nice concrete patio. The owners are very friendly and really take care of this park and it shows. This is a really nice, clean and well kept RV resort. Its easily accessible from the highway and a quiet location. This is a grass and gravel park with level sites and sufficient room between sites. Sites are full hook up and include cable and wifi. It appears most, if not all the sites have a concrete pad with a picnic table. The beautiful lake is the centerpiece of the whole place. We stayed in a pull through and the owner told me he wouldn't put anyone in the adjoining site which left us with plenty of room. As we have a fully equipped Class A motorhome, we did not have need for the bath house so I cannot comment, but from what I saw of the rest of the facilities, I feel sure it would be clean and well kept as well. If we are ever back in the area, we'll definitely be staying here again. I highly recommend it. What a hidden treasure! Immediately upon entering, you are greeted by the owner, who is friendly and knowledgeable. You immediately feel like you have left the world behind. Literally no noise, and tranquility takes over. Spaces are large and level. Some spots, along the lake, have gliders and a nice table and chairs. After 3 years of RVing, this is my favorite parks. Sure it will be yours as well! Clean, quite and very well kept. Nice wide sites with concrete pad, table and swing at each site. Stayed for a weekend and looking forward to our next stay. We stayed here while travelling home. It was raining quite hard and I wanted to get off the road and make an early evening of it. We got one of the only two pull thrus, but the back ins were easy to navigate. We had planned to only stay overnight, but decided to extend a day since the rain continued. The owner was very helpful. 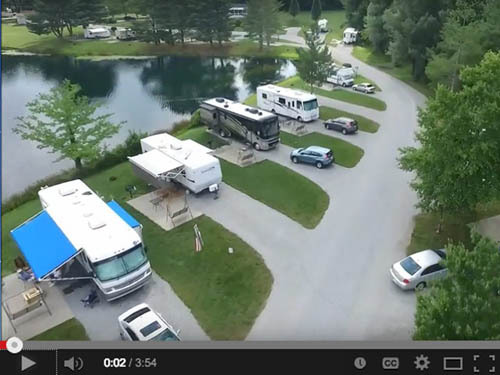 They had a couple of great club houses for RV rallies and several level and sizable sites encompassed their private lake. It is less than four miles off I40 and worth the drive. Quiet, secluded, a little bit of heaven in central Tennessee. Try it and you won't be disappointed. This is advertised as an adult Park. There is no play ground or pool. However, It is a great place. Kids ride bicycles and fish in the little lake( or big pond). The table and chairs, swing, and barbecue grill provide at each spot are near new. The parking spot is level and the concrete pads are in great shape. My wife and I told the Manager (owner?) we were in town to go to the Cumberland Country Place house. He was very knowledgeable about it. He told us a short cut to get to the Play house and suggested some good restaurants in the area. We were escorted to our site and offered to help us back in our RV. When we returned late the next night from the Play house we noticed how well lighted the part was which made pulling in our spot much easier. Everything about this park show the owners care. Grass areas are well kept. A lot of places to gather and sit and look at the lake. Docks to fish or look at the fish. Super quiet at night. You might hear a duck on the lake. 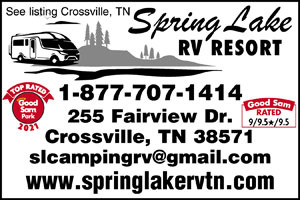 i have been to many good RV Parks, but this is the first I have been so impressed i wrote this review. I stayed here for a month. Very nice, clean, quiet, park in a beautiful setting! Sites are reasonably level and fairly spacious. Owners are extremely nice and helpful! Clean restrooms and laundry facilities! I would highly recommend this park!